I have found 61 documented Friedrich Wahle paintings with auction records (this also includes two painting currently for sale on eBay). Of these 61 records, images are available for only 22 of them. I mainly just know that Wahle paintings exist; I still need to tie them together chronologically and match them to art exhibits or magazine pages where they may have been originally published. There are additionally 2 unassigned images with no auction records and 1 painting that surfaced on the German version of “Antiques Roadshow”. I found 1 Wahle illustration from a 1914 book of translated German short stories (likely reprinted from a periodical). Most auction sales have taken place in Germany, with 14 total having been sold in Italy, Sweden, Denmark, Austria, Switzerland and the USA combined. During his lifetime, Wahle may have only been known regionally or nationally and so the majority of his works have been surfacing in Germany. The Discourse (my painting) at 49.5 x 36.8 cm is actually a common size for Wahle’s oil paintings. This may correspond to a full magazine page and so subsequent 37 x 37cm or 21 x 14cm works may have been partial page images. Also, almost all of the paintings I’ve found are oil on board; there are only a couple watercolors and half a dozen oil on canvas paintings. As a prolific professional illustrator, oil on board seems to be an intuitively cheap and easy medium. Overall, Wahle’s subject matter has focused on the interactions of people going about daily life. 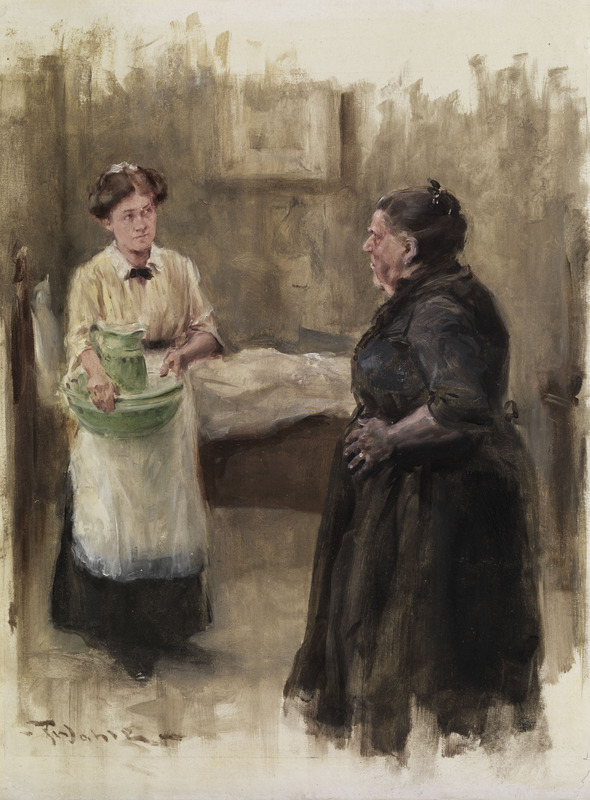 It’s incredible how many of his paintings show two people talking! The palette does tend to be natural colors and tones. 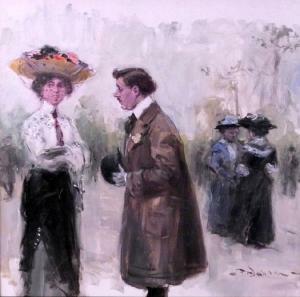 The image at the top of this post, Talk On The Boulevard, has some delightful color in the woman’s hat whereas The Service Personnel has muted brown with warm yellow and green. 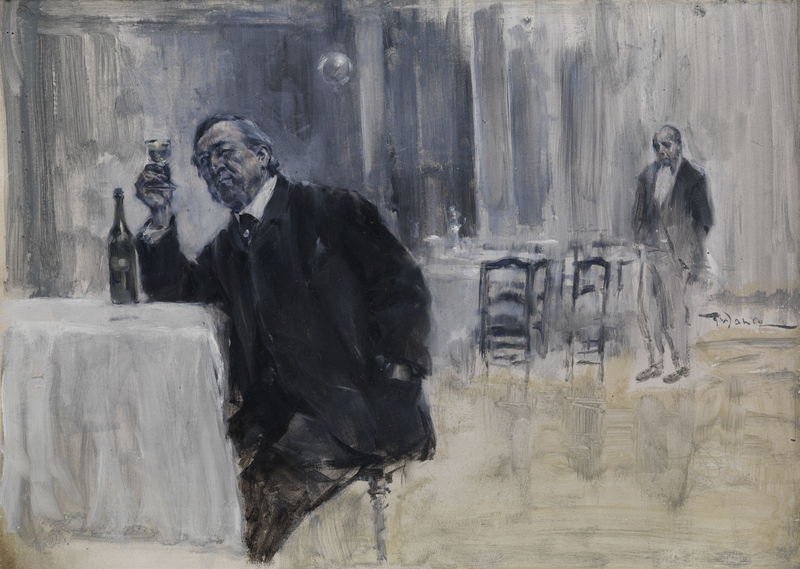 Some paintings are executed in a blue monochromatic fashion like The Discourse and The Wine Connoisseur below. I presume this was to facilitate the lithographic processing for reproduction but since I can’t yet date the “blue” paintings, I can’t correlate them to changes in magazine printing technology. I also find it interesting that many of the oil on board works are not finished up to the edges. For commercial printing, space would have been needed to crop the image or overlay text. I hope I find The Wine Connoisseur in Fliegende Blatter because I am certain that the ghostly butler figure on the right was completed cropped out of the final image. Having gone through 7 years worth of issues of the magazine Fliegende Blatter, I have found 96 Wahle works in addition to the 61 above. If we assume that he may have been active from approximately 1880-1920, then there could potentially be a lot more paintings to find! While continuing to document these illustration, I am going to start contacting auction houses and galleries in Germany to locate additional information but more importantly, images of sold paintings. I really hope to be able to match black and white magazine images with their painted source material. Shtina, you will ultimately have the catalogue raisonne for Wahle, hence a document which should be published! You research is becoming a valuable archive. You could even use it as the basis for a thesis! I am very impressed!! Thanks Elliott! This is such an interesting research project for me right now. I’m still considering how to publish or present this at the end. I appreciate the feedback!